In order to replace the screen on your XT926 you have two choices. You can buy the pre-assembled display which includes a new frame or you can get just the display and remove your old screen from the existing one and re-use it. We highly recommend the first option because it will save you a lot of time as well as making your Razr HD look like new from the front. If you want to save a few bucks you can buy just the screen itself but this requires more in the way of labor. Below this paragraph you will find links to the pre-assembled parts and an instructional video that shows how to replace your screen in about ten minutes. If you prefer the other option just scroll down the page a bit further and you will see how we used to replace this Droids screen until recently. 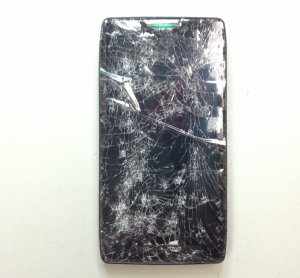 In this video we will remove and replace a broken screen on the Razr HD XT926. As you can see in the video this RAZR is badly beaten. Not only is the glass is broken but the LCD is damaged as well. That doesn’t really matter though because the replacement screens are complete pieces including the lens, digitizer and LCD. It’s all one piece fused together at the factory in order to seal the unit preventing dust from getting between the lens and LCD. It also reduces glare from natural and artificial light. Therefore, if you break one of them you are basically gonna replace all three at the same time. The good news is that this repair isn’t very difficult. We’ve got just a couple of T5 Torx screws at the bottom of the phone and we begin by removing these first. The one tricky part of this repair is actually getting the screen off. Before you worry about that though first get the two T5 screws removed. Then on the side we have a SIM ejection tray. For some reason this thing just doesn’t always eject properly. It comes out kinda part ways so if you have trouble getting it all the way out you can actually use your pry tool to remove it. I’m not sure why but sometimes these things pop right out and sometimes they don’t like to. It could be due to some sort of damage on the inside since most of the Razrs that I’ve dealt with have been physically damaged. In any case if you get stuck just pry gently on the side very carefully and you should be able to maneuver this out of the housing and that will remove your LTE card. If you happen to have an SD card it will be located right next to where the tray came out so make sure that you remove it before proceeding with the repair. Failure to do so can result in permanent damage to your memory card. Just push down on it and it will partially eject making it possible to remove it. Now what’s supposed to happen next is that you slide the entire panel the front of the phone straight up towards the top and it should release. In my experience though a lot of these can be very stubborn. What I’ve noticed that works at least for me is that if you pry near the center of the bottom edge of the frame you can release two clips without damaging them. This will make sliding the front assembly upwards possible but still leave everything intact so that the panel will lock into place again when you assemble the phone with a new screen. Once you release the two clips be very careful as you slide the panel off as there are two flex cables connected to the main board on the inside. In order to release these cables you should first carefully remove the heat resistant tape that covers the FFC connectors. Then slide the cables out of the connectors paying attention to the way that they are positioned. The larger one which connects to the LCD may slip out in the process so don’t get worried if it does. The important part is making sure to connect it properly when installing the new screen. If you put the phone back together and the LCD doesn’t turn on there is a good chance that this larger cable has slipped out of position and you will need to re-install it. I’ve updated the page with new links above. Thanks for the comment.